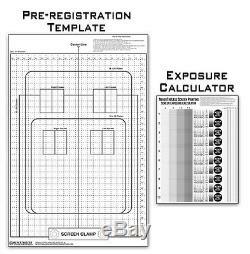 FOR A LIMITED TIME ONLY, WE WILL BE INCLUDING A FREE Pre-Registration Template Transparency Poster and Screen Exposure Calculator. Lincoln ES3 20x24 Exposure Unit. Ready to start exposing high detail screens in your screen printing operation? 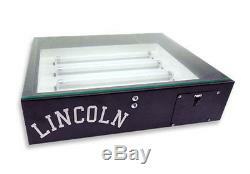 Then NTL's Lincoln Exposure Unit is the right choice for your business! Lincoln ES3 Series Exposure Unit Features. Overall Dimensions 24"(W) x 20"(L) x 10(H). Includes 1 piece of foam padding and instructions on how to use. You will need to supply one piece of plywood, or similar and weight for your foam pad. MAX Screen Size: 20"x 24" you can use larger screens, but the edges of the screen will hang over the exposure unit. Lincoln ES3 comes with our standard ON / OFF switch. Non-Corrosive Light Weight Steel Construction. High Quality Durable Powder Coated Components. 1/4 thick optically clear glass. High Quality UL Certified Electrical Components. Runs on Standard 120V Electric. USER & MAINTENANCE MANUAL INCLUDED. 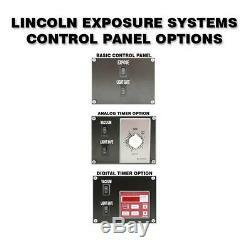 Lincoln ES 20x24 Series Exposure Unit Upgrade Options. Lincoln ES1 comes standard with our Highly Accurate Digital Timer with Auto-Off. Lincoln ES2 comes standard with our Highly Accurate Analog Timer with Auto-Off. This unit will expose dual cure emulsions in 2-3 minutes and photopolymer emulsions around one minute. We highly recommend starting with a step wedge exposure test, to dial in the exact exposure time, for your circumstances. 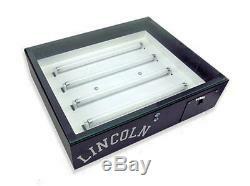 Replacement / Repair parts are always available, no matter the age of your Lincoln Exposure Unit. The item "Lincoln 20x24 Exposure Unit for Screen Printing silk screening with Free Gift" is in sale since Thursday, December 15, 2016. This item is in the category "Business & Industrial\Printing & Graphic Arts\Screen & Specialty Printing\Screen Printing". The seller is "nevertheless_sps" and is located in Michigan.